Located in Windy Hill Beach, these 2 & 3 bedroom condossit directly on the beautiful white sandy beach, and offer panoramic views that are second to none in North Myrtle Beach. The oceanfront outdoor pool is a wonderful place to go for a dip, read a book, or just enjoy the company of the people you’re with, as you all take in the North Myrtle Beach vacation lifestyle. Most condos have whirlpool tubs in the master bathroom, a perfectly relaxing way to end your day before good nights sleep listening to the crashing waves of the Atlantic. Spinnaker offers 2 elevators and secured entry for your added convenience, and most come with a washer & dryer right in the condo. If you’re planning on visiting area attractions, shopping complexes and restaurants while you vacation here, Spinnaker is very conveniently located near all the best places you can visit while staying in North Myrtle Beach. 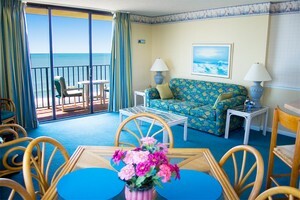 Families and couples of all ages agree….Spinnaker is a classic spot to enjoy your vacation!